Orange Beach is located in Baldwin County between Gulf Shores to the west and Perdido Key, Florida to the east. This coastal community is experiencing immense amount of growth, both as a tourist destination and a residential area. Gulf-front condominiums lure tourists and new residents to the white-sand beaches that the area has become associated with and these same visitors come back year after year. Aside from luxurious waterfront condominiums, the Ono Island community has become the popular choice when considering a subdivision to buy or build a house in. Perhaps the most popular destination in Orange Beach is the world-famous Flora-Bama Lounge & Oyster Bar, which hosts huge annual events such as the Tri-State Mullet Toss and live music. Orange Beach is a water-lover’s dream! Besides the beautiful Gulf of Mexico, there are a number of waterways running through Orange Beach. The Old River, Perdido Pass, and Bayou St. John are three of the major waterways where residents and visitors choose to go fishing and boating and they are even used as a way to get around the city and up into other areas of Baldwin County. As the locals will tell you, nothing beats boating around Robinson and Bird Islands with a cold drink and some friends to enjoy the view with. Many of the condominiums and water-front homes in this area have boat slips available for residents and guests. Turquoise Place is, easily, one of the most distinctive condominiums in Orange Beach thanks to the shimmering turquoise glass running the entire length of the towers. This distinctive design is part of what makes it so popular: it’s easy to spot and aesthetically pleasing. 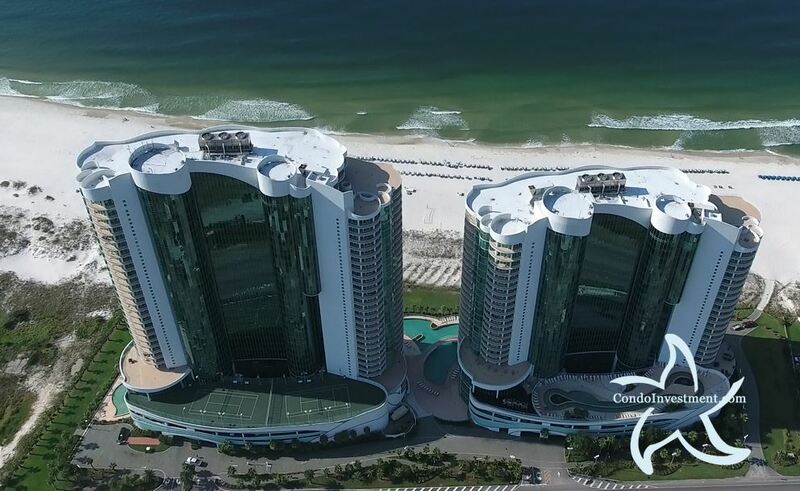 Looks go a long way when people are looking for the perfect vacation destination or potential second home and Orange Beach offers some of the most visually stunning condominiums on Alabama’s Gulf Coast. Bella Luna, with its distinctive arch shape and beautiful glass paneling, does not have nearly as many units as Turquoise Place and might not be as well-known, but still offers one of the more beautiful getaways in town. When you’re looking for something even more private than Bella Luna or Turquoise Place, Opal becomes the obvious choice. Opal is one of the most private condos in Orange Beach, with privacy walls and rent-restricted units right on the Gulf of Mexico. Some other similar condos in the area include Phoenix Orange Beach (currently under construction) and the Admiral’s Quarters.